Archives : DOUBLE TOP ??? - 04/12/2009. DOUBLE TOP ??? – 04/12/2009. The market bounced back on Monday and went from strength to strength throughout the week. After testing the previous intermittent top, the market is now consolidating near the upper end of the range. Last time we had written that the indices need to close above their respective 50dmas (Sensex – 16798 & Nifty – 4989) for the short to medium term uptrend to resume. The indices closed above the 50dma on Monday itself and once again reversed the short to medium term trend to up. Nifty registered a high of 5181 during this week which is the same as previous intermediate high recorded in October. The market reacted from that level and is currently consolidating near the top. Can this be termed as a Double Top? No doubt, the current top is 5181 which is the same as previous intermittent top, but this cannot be classified as a Double Top yet. 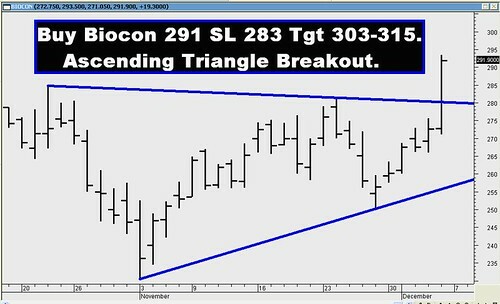 A Double Top will be confirmed once both the Sensex and Nifty breaches the previous intermittent bottom of Sensex – 16210 and Nifty – 4806, till then the indices will be considered to be consolidating. The Sensex opened the week at 16655, made a high of 17361, a low of 16655 and closed the week at 17101. The Sensex closed the week with a gain of 469 points, thus forming Opening White Marubuzo on the weekly charts. It almost completely engulfs the previous week’s black body. In this case it cannot be termed as a Reversal Pattern as it has occurred at the top of an uptrend. Such formations are usually signs of distribution and can be negated only if the Sensex closes above 17361. The Sensex has closed above its 50dma and hence short to medium term trend has turned up. The 50dma (16798) will provide strong support in case of a correction. The Sensex has been moving up in an upward sloping channel. The lower end of the channel which falls at 16012 should act as strong support. The Indicators like MACD & ROC continue with their buy mode while RSI (55) continues to stay above 50. Strong Trendline support for Sensex is at 16522. For the week ahead, Sensex will face Resistance at 17290-17494-17690. Sensex will find Support at 16913-16847-16635. The Nifty opened the week at 4942, made a high of 5181, a low of 4942 and closed the week at 5108. The Nifty closed the week with a gain of 167 points, thus forming Opening White Marubuzo on the weekly charts. It almost completely engulfs the previous week’s black body. In this case it cannot be termed as a Reversal Pattern as it has occurred at the top of an uptrend. Such formations are usually signs of distribution and can be negated only if the Nifty closes above 5181. The Nifty has closed above its 50dma and hence short to medium term trend has turned up. The 50dma (4989) will provide strong support in case of a correction. The Nifty has been moving up in an upward sloping channel. The lower end of the channel which falls at 4731 should act as strong support. 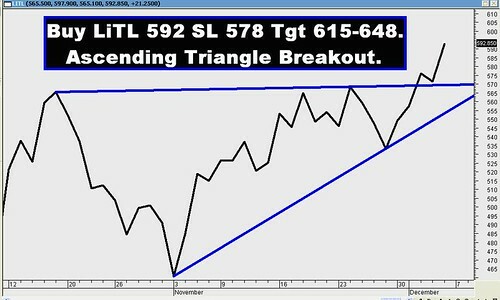 Strong Trendline support for Nifty is at 4894-4818. Nifty O.I.PCR is at 1.58. Heavy PUT writing is visible at strike price of 5000 and 4900 which should act as support in case of correction. Strong CALL writing is seen at strike of 5200 which will act as resistance. For the week ahead, Nifty will face resistance at 5181-5254-5298. Nifty will find support at 5054-4983-4904.
week with a gap and went from strength to strength, all the ‘Buy’ recommendations reached their targets and went much beyond, but the ‘Sell’ recommendations had their stop losses triggered.